“The global fantasy sports market size will grow by USD 7.62 Billion during 2018-2022” said by Technavio in their Global Fantasy Sports Market 2018-2022 research report. Therefore, this statement stands as a substantial proof that how fantasy sport is a potential and the escalating market for both investors and audiences of various kinds of sports like soccer, football, baseball, basketball, and cricket. As a result, fantasy sport has earned more than 59 Million players in only USA and Canada, let alone the rest of the world! Therefore, Auto Car Race sports is also catching up its pace into the Fantasy Sports industry. In this article, we will discuss the emerging market of fantasy motorsports that is full of business opportunities like fantasy motorsports/auto sports app development, etc. Talking about the concept, Daily Fantasy Sport (DFS) is a game that fuses fantasy and reality together. In this game, the player makes a team of real players from different teams and gets points according to the performance of those players in the real game. Furthermore, those points or credits can be converted into real money. Due to the perpetual enthusiasm of sports fans and intuitive gaming experience, fantasy sports is destined to revolutionary growth. The billion-dollar revenue and millions of active players speak for themselves. Motorsports enthusiasts are in all over the world connecting them with fantasy sports app is an outstanding business investment. Started in the late 1950s in the form of Fantasy Golf and then in 1963 as Fantasy Football League, fantasy sport took a little bit longer time to capture a big market share in the previous century. However, after the digitalization, this sport took off to the higher skies. The fantasy sport is not subjected to a particular sport. Hence, fantasy sport is spreading its wings over every sport out there. Started in 1963, fantasy football is a booming market with an estimated worth of $7 Billion and over 59 Million players across the USA and Canada. 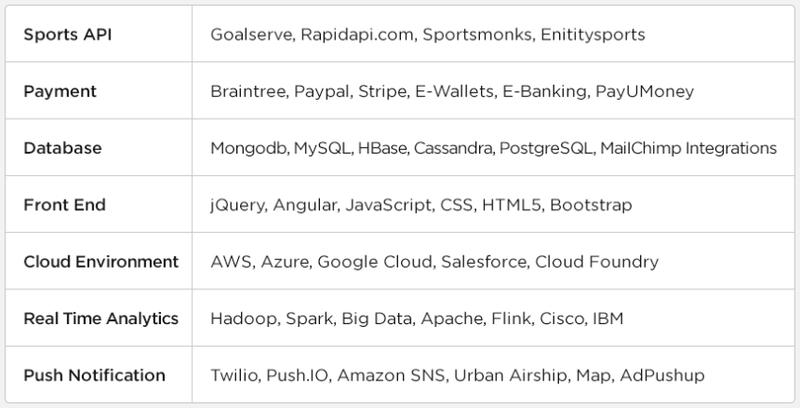 These websites earn profits from entry fees, (varies from $5 to $5,000 USD) generating 2.6 Billion in 2015. An average player is expected to spend $556 USD a year on entry fees and league materials. 54% of fantasy sports players are between 18 to 34 years age group. 53% of players are using their smartphones to play fantasy sports games. This fantasy sports madness is not just limited to football. Fans of other sports like soccer, hockey, baseball, basketball, and cricket are investing in their favorite sport and playing. Believe it or not but fan following of motorsports like formula 1 and NASCAR is not less than other sports like NBA. Millions of auto sports fans are there in USA alone; they would love to have something like fantasy sports for fantasy formula 1 and fantasy NASCAR for a whole new experience. It was 2017 when the global motorsports market was valued at $4.2 Billion. It is expected that the market will continue to grow at 8.43% CAGR during the period of 2018 to 2023 and will eventually cross $6.87 Billion mark by the year 2023. So far the revenue is generated from various ways like advertising, ticketing, sponsorship and merchandising, broadcasting and hosting fees, etc. According to a fan survey, 25% of 16-34-year-old fans want to watch F1 Live streaming via laptop and smartphone. The percentage of people describing Formula 1 ‘exciting’ has tripled between 2015-2017. These stats only represent Formula One. You can imagine the collective popularity and increasing fan base of other motorsports like NASCAR and IndyCar, etc. Imagine having realistic sports leagues like fantasy formula 1, fantasy NASCAR, Fantasy IndyCar, all of them combined in one app to give a complete experience. The point lies behind the simple observation that the stats say 25% of the overall audience want to watch live streaming of motorsport race and 54% of the fantasy players are aged between 18-34%. Combining both stats gives us a clear picture of a potential engagement of Fantasy Motorsports games for Formula 1, NASCAR, IndyCar, and more motorsports. The market of motorsports is increasing, all thanks to social media, live streaming services like YouTube and not to forget the manufacturing of affordable laptops and smartphones. Because of these revolutions the fan base and global market of Formula 1 has increased significantly. Here are some stats giving you a clear picture. Talking about the popularity, the global average attendance of 2016/2017 season per match was 76,722. To give you a contrast, the same overage attendance for the same season for UEFA was 43,016 and for Premier league, it was 35,822. This may give you a whole picture of how large market are we talking about. Formula 1 has acquired a stake in Dublin-based fantasy sports player PlayON for an undisclosed sum. If we look at the estimated fan base of NASCAR in the only USA, the number reaches a whopping $75 million mark. Looking at the annual income of an average NASCAR fan varies between $40K – $75K. In the USA, NASCAR is the #2 sport on television. NASCAR is consistently a hell of a performer among all major sports, making over $2 Billion in licensed NASCAR products. Fan engagement of any sport has risen exponentially after being touched by fantasy sports. To exemplify, NBA bags around $7Billion of revenue every season, now the surprising thing is, the fantasy sports market is also worth about the same in its current state. In addition, sports are achieving the heights of popularity like never before. This example successfully projects the optimistic vision of collaboration of fantasy sports and motorsports business. If the fantasy sport can walk hand-in-hand with the NBA, making almost the same revenue then it would not be just fantasy to see fantasy sport catching up the motorsport market. When is the right time to invest in Fantasy Sport? Formula One invested in fantasy sports in 2018 and it was a big green signal to all potential investors. Therefore, NOW is the best time for putting your money in fantasy motorsport. Since the majority uses smartphones to play fantasy sports games then motorsport application for both Android and iOS is essential. However, it would not be a wise option to leave the audience hanging high and dry, that prefers a laptop or desktop to smartphones. Hence, capturing the audience with a web application is a good option too. A smartphone application and web application both are crucial to giving an interactive and enticing user experience to fantasy motorsport player. Before we proceed towards the actual fantasy sports app development part, let’s take a short excursion to see what a fantasy sports game is going to look like and how to play it? Since we have some many sports in the motorsport category; let’s understand the concept of Fantasy Motorsport by one particular sport, Formula 1. Step 1: You can create 3 teams. Each team can have 5 drivers and one constructor. The player may be from different teams in real life. Here is the twist, a player needs to make sure you that the valuation of each team must be under $100M budget. Each driver and constructor has their own valuation. For example, L. Hamilton has $30.5M value. On the other hand, Ferrari boasts a value of $29M. You need to choose one turbo driver from each team and that turbo driver must be of less than $19M. Then you are all set. According to the performance of selected drivers in the real race, the point distribution takes place. Step 2: This step comprises more of taking live updates and getting real-time data to track the performance of drivers. However, I would like to add one more point here, a player needs to consume a lot of data of current drivers position and performance analysis. This research helps them to build a better team. Because the game of Fantasy Formula 1 is as real as it can be. Step 3: After the race, the points are allotted to your drivers and constructors according to their performance. This step evaluates whether you win or lose. For a fan, Grand Prix and world championship can be a source of entertainment or just fun; for some enthusiasts, sports is a religion. Therefore, sports must be played safe and clean. To keep it clean, there are rules. 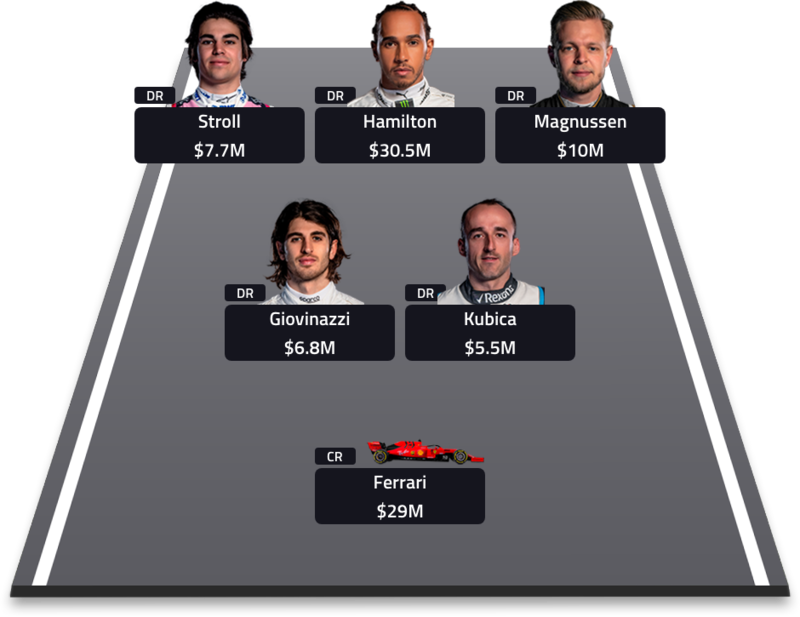 No doubts Fantasy Formula 1 has rules of their own. While you go through the rules you will notice that some of them are fundamentals and can be used in other modes of fantasy Motorsports (Fantasy NASCAR, Fantasy IndyCar) as well. A player needs to pick 5 drivers with one constructor to form one team. It should be under a $100M budget. The actual performance of the team in a Grand Prix will determine the points of team members. Turbo driver for each team will earn double points for a team. A player can make as many changes as he/she wants before the team-picking deadline that closes right before the starting of qualifying of the first race of the season. Increase and decrease in the price of the team’s drivers will be reflected in the budget available for the player. All teams are locked right before the start of qualifying. No further modifications are allowed for that Grand Prix. The player may see the team members of his selected teams. First picked up a team of a player goes automatically into Fantasy Formula 1 global league and the league of the player’s favorite constructor as well. A player can create his/her own private league or can enter other private leagues that offer single or multi-entry per player. While setting up the private league, a private league code is created; with this code, a league can be shared and created. Based on the events in the scoring matrix, drivers of the team collect points for their performance in the race. Apart from the “driver only” scores, constructors score their points accumulated by their drivers. Prior to the season start, a player has the liberty to make as many changes as he/she wants. After season starts, a player can make only one FREE change to each team between each race. Furthermore, after a free change, for each change, 10 points will be deducted. There is a wildcard scheme, which gives the ability to the player to change the entire team between races. The wildcard can only be used twice a season, once before Hungarian Grand Prix and once after. Playing a wildcard before a race means the player can now make unlimited changes to the team before the race. One wild card can only be used in the first half of the season and another one can be used only in the second half. A player cannot carry an unused wildcard to another half of the season. 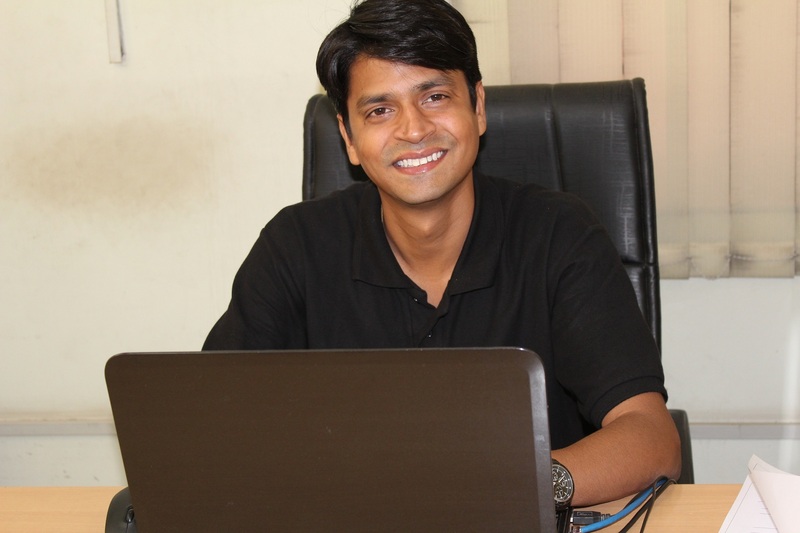 Features and functionalities are different for a user and for the admin. Let’s break them down one by one. It is the very first screen seen by a user in a Fantasy Motorsport app after logging in with the help of a registered account. Users will find the upcoming Grand Prix and other races. On another tab, the user can select teams. 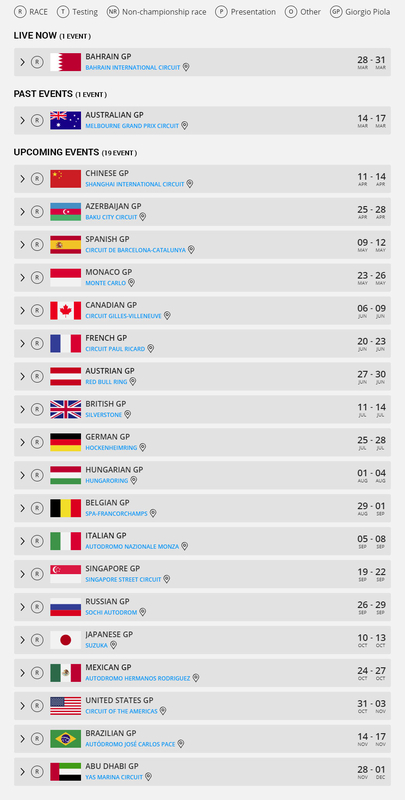 A Fantasy Motorsport App may show various races like NASCAR, Formula One, Formula E, IndyCar and many more. Therefore, in this section user can browse through various motorsports. This is the place where a user can manage his/her profile. It includes various interactions done by the user and possibly earned credits for various motorsports. Here a user can create a private league. In addition, the user can invite other users into the league as well. In this section, a user can join Global and Private Leagues to play Fantasy Formula 1 or any other Fantasy Motorsports Games. As the name suggests, this section is the track record of users’ winnings; a good to have an option in a Fantasy App just to give user accessibility. All the GPs or any races participated and their performance records are stored here so the user can check them easily. It is good to have an option that ensures a seamless user experience for users to play continuously without having to pay from their bank accounts every now and then. Yet another good-to-option that helps to build a community where a user can refer the fantasy motorsport app to a friend and when the friend starts using the app both parties earn predefined credits. This section has multiple statistics dashboards for various fields like the number of active users, new users’ registrations, total income, and revenue, etc. Admin can access profiles and perform actions like, add, edit, delete users’ profiles. Admin can track earning from various sources and regions. Having multiple filter option can help admin to get precise data. Assigning reward points, modifying reward points and other reward points come under this section. Managing prizes for public or private leagues falls under this section and admin can create and manage multiple rewards schemes here. Admin can perform actions like reviewing bank withdrawal from the user and accept and reject those requests if the details are not acceptable or any other reasons. Admin can manage, modify, add whatever information is available on the entire application. It gets easy for users to stay up to date with the actual race and get access to various relevant data like driver position, points, and many data as well. It gets convenient to manage emails, notifications, user locations, and many other back-end services with the help of CRM. Like we have talked about it before, content management offers control over every content on the app. This feature gets useful when the user wants to see details about their teams and drivers. It is handy to have this option inside the app itself. It promotes the maximum interaction from the user’s end. Live updates of race, notification for earned points and upcoming race reminder and many other such options make it helpful for a user to encourage more user engagement. Having features like VoD inside the app makes it far better for the users to not only play the fantasy motorsport games but also gaining more knowledge by watching visual content and forming a better team for the next play. Offering live games like a prediction for the upcoming moment in the live game makes it the race even more fun and exciting. The user engagement gets more intense. Knowing that NASCAR is making $2B with just official licensed merchandise is a tempting idea to offer users official merchandise of their favorite sports, player or constructor. Chatbot will make it easy for users to get answers for some FAQs. This feature enables admins to show the users ads according to their locations and their frequent visits may also show their interests. This is how the ad display can be more personalized. Having multiple payment systems like e-Wallet, Net banking, Debit and Credit cards will let users perform transactions with ease. Not every user is a fan of installing a dedicated app for playing fantasy sports app in their phone, the reason is obvious, LIMITED SMARTPHONE STORAGE which eventually makes phone slower. Here comes fantasy Motorsports web application for the rescue. These apps are snappier in usage and do not require much of the space. Therefore, your phone won’t feel a thing while running this app without compromising much of the app’s core features. It doesn’t hurt to have options like fantasy motorsport app and fantasy motorsport web application. Great craftsmanship delivers the finest quality product. This applies in application development as well. 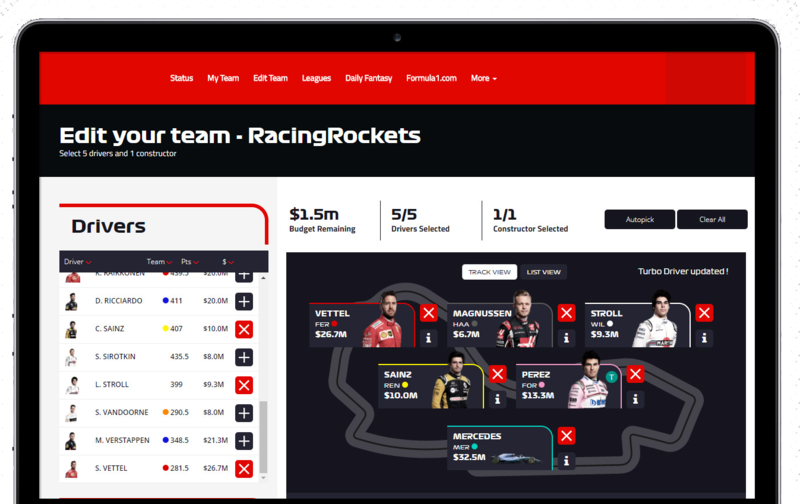 For building a flawless fantasy motorsport app, you require a fantasy sports app development company that has the complete repertoire required in the process. The revenue model for fantasy motorsports game for formula 1 and other motorsports is full of possibilities. Since we do not have an example of existing fantasy motorsport, we can take inspiration from the revenue model of fantasy games for other sports like the NBA and NFL. The obvious earning source is entry fees for joining private and custom leagues. Fantasy Sports websites like DraftKings and Fanduel earned $3B in the year of 2017 from just entry fees. The app can charge users for performing actions (other than free actions) like making changes in the team, extending budget for per team, etc. If the app offers additional premium features to the user like VoD and other stats sheets, then the app can create premium packages for a particular facility. The app may have internal currency, which will be used for purchasing various in-app features. To encourage users or players to pay for more for entry fees an app may provide various motorsport, driver, and constructor related content. Private leagues with attractive prizes are some of the great ways to attract more motorsports enthusiasts to lure them into playing more and entering in more leagues. Hence, the possibilities are unlimited. All it requires is the new and creative ways to attract more players or users to play fantasy motorsport games. How much does it cost to develop an app for Fantasy Motorsport? No doubt, fantasy motorsports is a promising investment, which offers not only profit but also a great user engagement. Now coming to the part, how much would it exactly cost to make a robust app that satisfies the users, with experience and you, in output; you know what am I talking about, don’t you? Best results come from the best of the fantasy motorsport app industry. 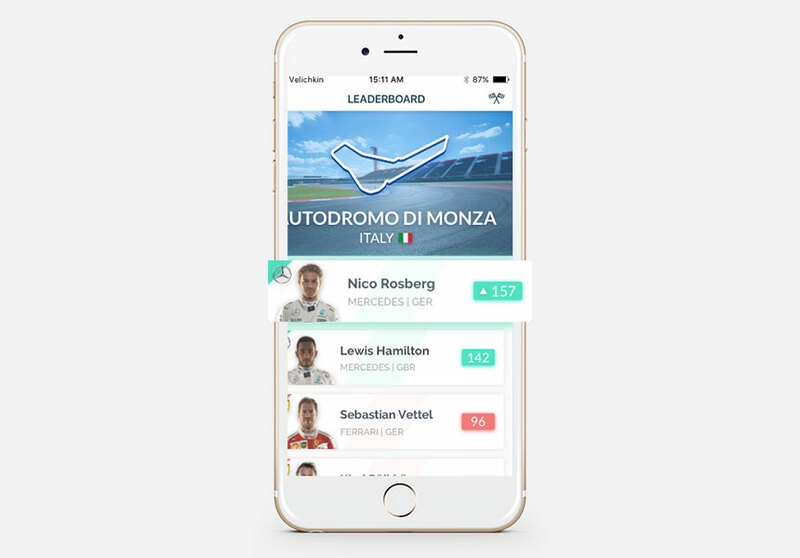 By teaming up with the experienced and proficient companies can offer you a premium experience fantasy motorsport app for iOS and Android as well as the web application. The development cost from backend to the front end, furthermore, the user experience finishing, may cost somewhere between USD $25000 – $60000. There is a fine line between sports betting and Fantasy sports. Fantasy sports is legal in most parts of the world, unlike sports betting which is legal in a handful of places. The fine line which differentiates between fantasy sports and sports betting is, fantasy sports is a skilled based game whereas betting or gambling is a game of chance. However, it is crucial to consult the legal authorities before creating fantasy motorsports. Because some of the features may blur out the fine line between fantasy sports and sports betting. In order to have a clear view, you may check this pdf to know more about the legal aspects of fantasy sports in the USA.